A cataract is a clouding of the eye's natural lens. When we look at something, light rays enter our eye through the pupil and are focused through the lens onto the retina, a layer of light-sensitive cells at the back of the eye. The lens must be clear in order to focus light properly onto the retina. If the lens has become cloudy, this is called a cataract. 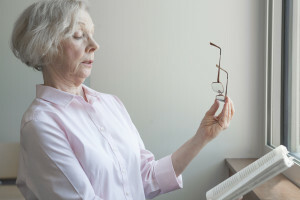 At the beginning you may not notice any changes, but as the cataract progresses, you may begin to experience blurred vision, glare and halos that interfere with your daily activities. The only way to diagnose the cause of the vision problem is by a complete eye exam performed by your ophthalmologist. Fortunately, cataracts can be removed and replaced by a new clear lens to restore your vision. This procedure is called cataract surgery and today there are several options to perform this procedure and several type of lenses to choose from. This is the traditional way of doing cataract surgery and it is very successful and efficient. Small incisions are made to enter the eye, the cataract is removed using micro-ultrasound energy and a new lens is used to replace the cataract. This the latest, most modern technique for removing cataracts. It involves using a laser to construct the incisions and divide the cataract into small pieces that can be easily removed by aspiration. A lens is also placed inside the eye. This procedure has the advantage of being very precise and be able to treat astigmatism at the same time.